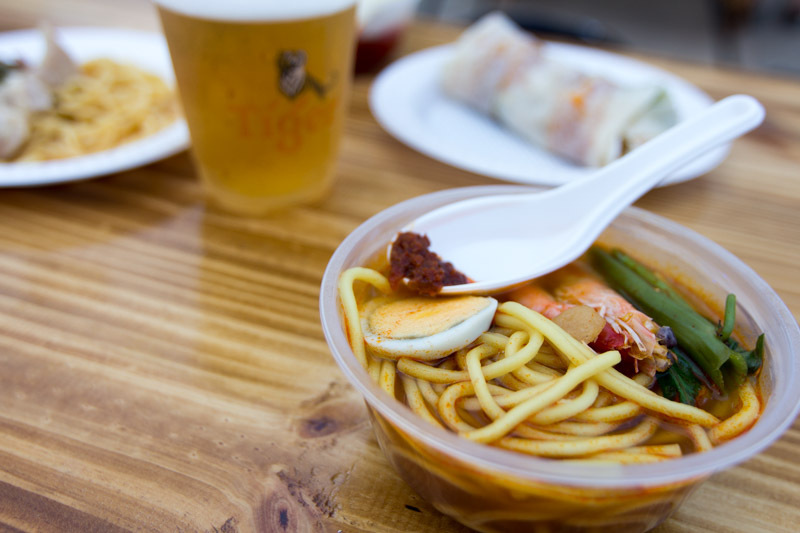 With promises of beer and great food, I went early to check out the Tiger Street Food Festival on 22 September 2017 before all the queues started forming. 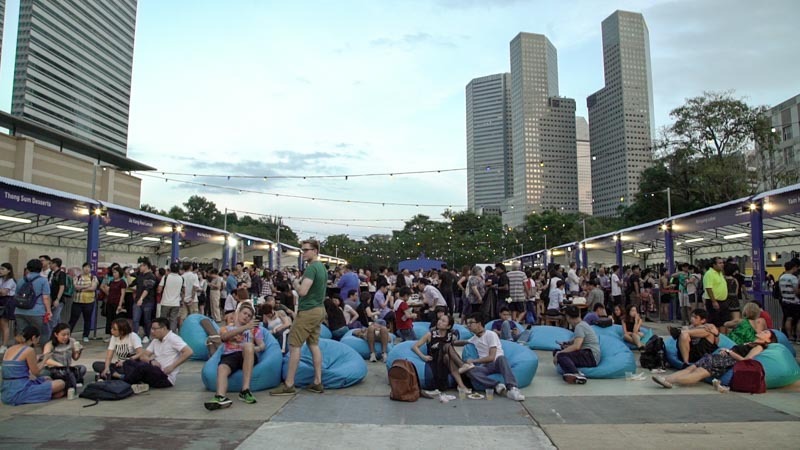 The open field at Tan Quee Lan Street was set up with tables, stalls and even a stage for the live music acts to perform. Each stall had a board to show which beer would pair best with the dish they were serving, so I went with the most unexpected dishes that would pair well with beer. 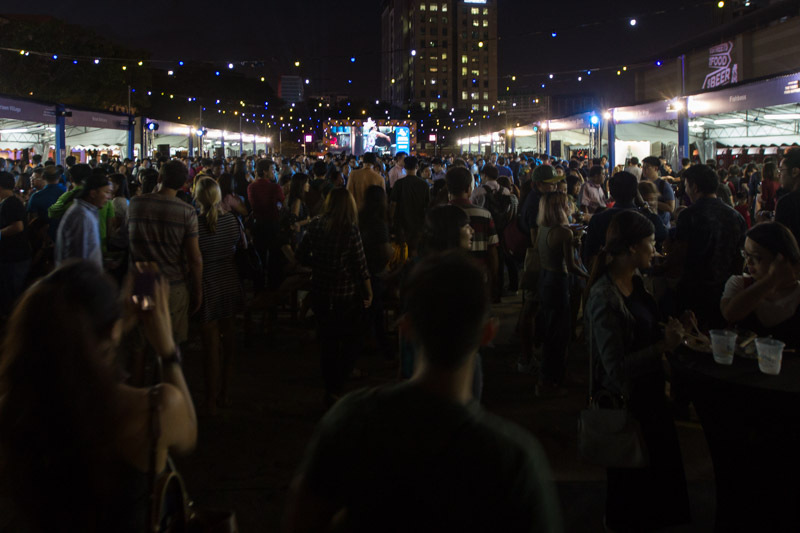 Each dish was priced at an affordable $2 for a tasting portion so that festival-goers would be able to try a wider range of dishes. Starting with Prawn Noodles from Prawn Village, I found that there was a good amount of spice from the chilli that added to the depth of the rich soup. The noodles were springy and I enjoyed tucking into the fresh prawns. Pairing it with the recommended Tiger Black ($6), the beer’s roasted notes shone through and complemented the sweetness of the broth. 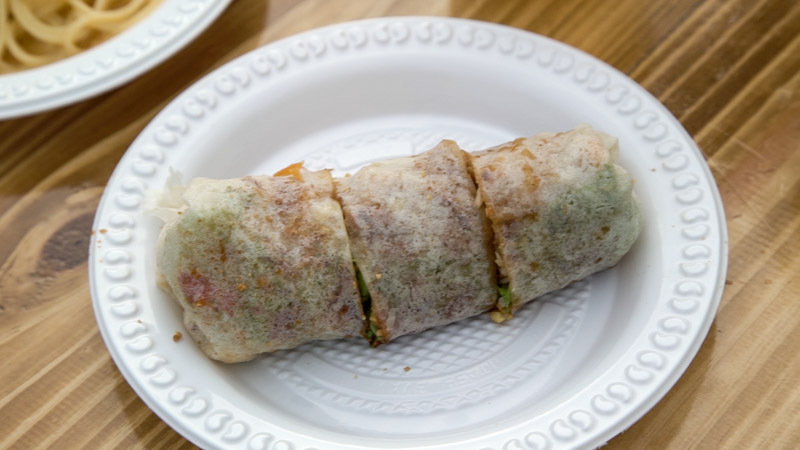 I tried the Popiah from one of the popular new hawker stalls, Kway Guan Huat Joo Chiat Original Popiah & Kueh Pie Tie, and I loved it; the skin was thin but still strong enough to contain all the ingredients, and there was a nice balance between the sweet sauce and the chilli. The classic Tiger Beer ($5) was refreshing and the slight citrus notes were great for pairing with a lighter dish. There was a really long queue forming at the stall for Salted Egg Yolk Pasta, so being the kiasu Singaporean that I am, I decided that it had to be good and joined the queue as well. The pasta was cooked al dente with a sauce that wasn’t too watery, although I did feel that the portion could be slightly bigger. 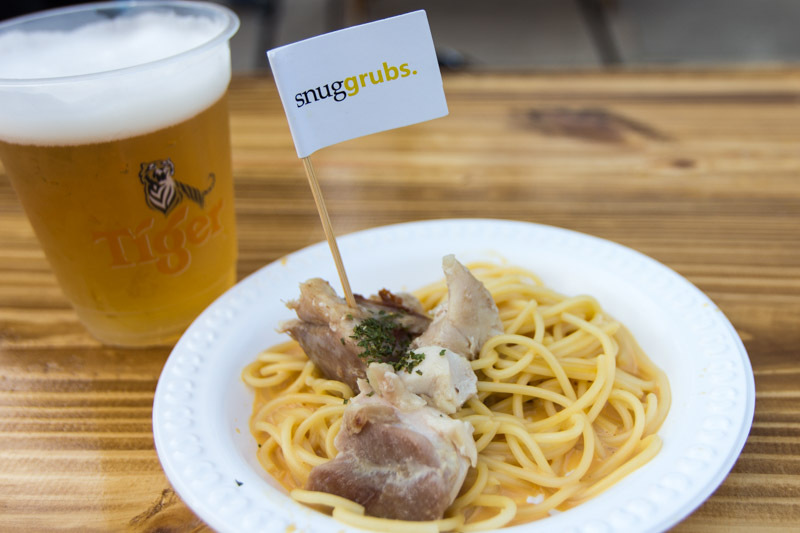 Even though the board recommended that the pasta dish is to be paired with Tiger Black, I went with a cup of Tiger Beer ($5) instead because I felt that the stronger taste of Tiger Black would mask the flavour of the salted egg yolk sauce. The food and beer pairings were the main highlight of the event, but with live music performances from bands like HubbaBubbas and Astronauts, I found myself really getting into the mood of the festival. The old school lights strung up across the venue certainly helped to enhance the nostalgic vibes. It almost felt like I was at a night market with all the smells of the delicious dishes being cooked around me. 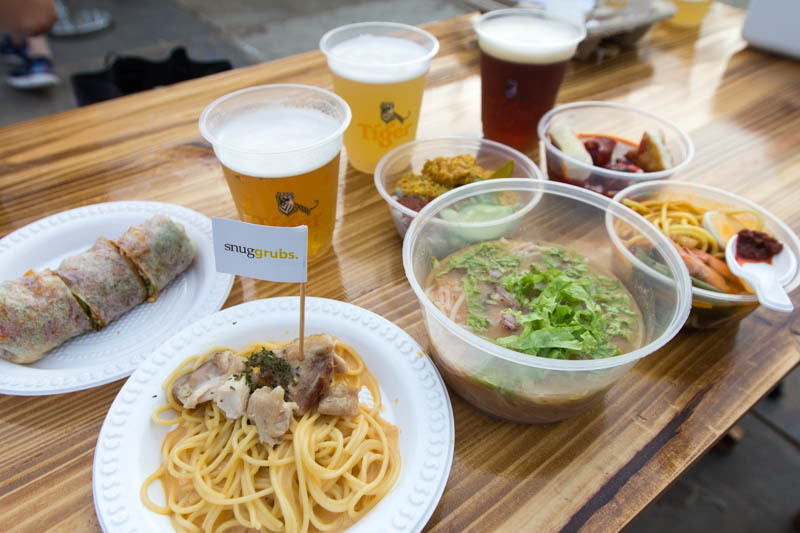 But the whole point of the event was to raise funds for the Tiger Street Food Support Fund, which goes to supporting new and aspiring hawkers, and it was definitely a success with over $72,000 raised. 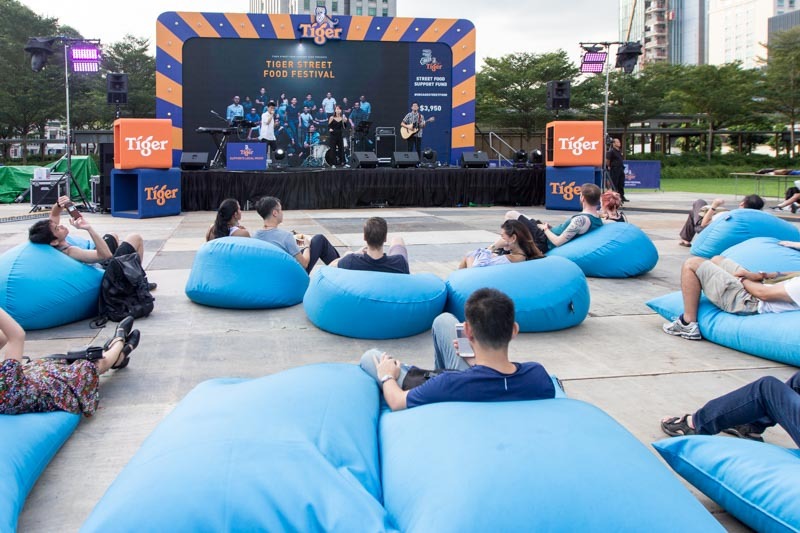 Not only was this a great way to give the recipients of last year’s Tiger Support Fund exposure to the public, but I thought it was a really nice touch that the recipients were paying it forward for next year’s fund to help more hawkers. With so much concern going around now about the preservation of the hawker culture, I’m glad to see that Tiger is doing something to help keep it alive!